When configuring Load Balancing for SSL (HTTPS) connections you have a number of options. In many cases you will want to use SSL Offloading wherein the Netscaler negotiates the SSL encryption with the client and unencrypted traffic is then passed to the server (offloading the SSL overhead from the web server and reducing server load). In some cases, however, you may not want to offload the SSL overhead and instead allow IIS or Apache to negotiate the SSL communication as they would were the connection not traversing a load balancer. 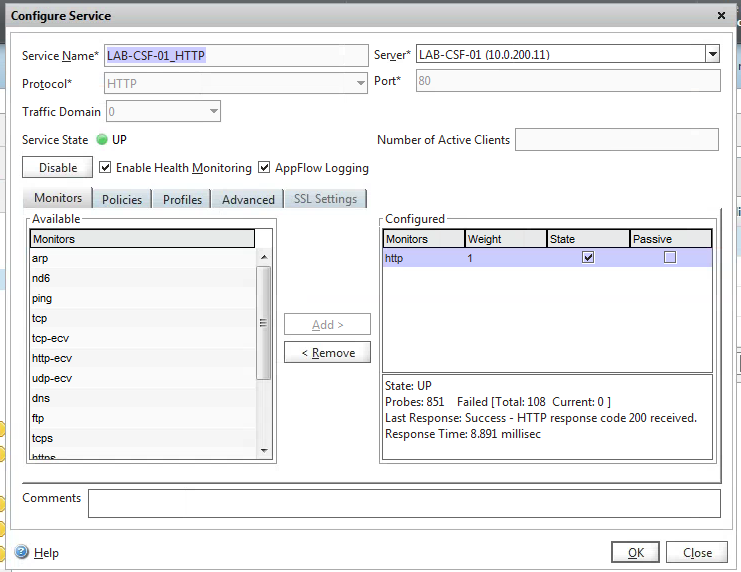 The example below enables load balancing for two Citrix Storefront servers with both the HTTP and HTTPS protocols on port 80 and 443 respectively. This assumes you have a Netscaler deployed, licensed and configured with appropriate networking (in particular, a NSIP and SNIP are defined). Note that this will re-write the source address and traffic will traverse the Netscaler to both send data to the web server and to reply to the client. 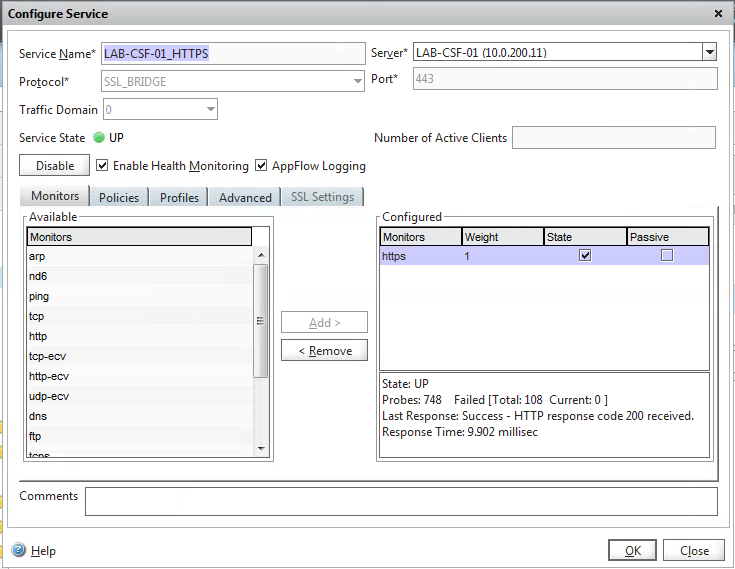 Access Traffic Management -> Load Balancing -> Services. Now, we need to configure services. These define how we determine which servers are functioning. Note: The protocol is SSL_BRIDGE (not SSL). This enables you to pass the SSL communication to the servers without offloading. Now, we create virtual servers. Create a virtual server for each port we’ll be load balancing. If you will be balancing two ports on the same IP you will need two virtual servers. And you’re done! Test with a telnet session on port 80 and port 443 to your virtual server IP and confirm that the connection is not refused. What about certs? You don’t mention them at all. Hey Dave – thanks for asking. This example assumes that we are not doing SSL offloading with the Netscaler. In other words, we’re forwarding traffic on port 443 to the web server and the SSL certificate is installed on the web server itself (and configured for the website). Excellent one but what we are doing is we have f5 which is redirecting the traffic from http to https, so any idea what we do on the Storefront as we have 2 Storefront for load balancing. If I understood correctly we will have to install the same certificate on both Storefront Servers and then in the change base url we point to VIP IP of the F5, is this right? Any thought suggestion would be appreciated!!!! You could do exactly that with your F5 load balancer. Alternatively, you could install your certificate on the F5 and have F5 terminate the SSL connection. In that scenario the clients will talk to F5 on port 443 and the F5 would communicate with Storefront on http/port 80. In either scenario the VIP host name would be your base URL.